A song consists of a number of elements that must all serve one purpose. In the space of 3-4 minutes (or sometimes as few as 1.5 minutes, or as many as 7-9 minutes), a song must put across one idea, what I call the ‘BIG IDEA‘. This must not be ambiguous or vague, or leave the listener guessing what the song is really about. The listener must be able to ‘get’ the Big Idea in one listening. And the Big Idea should be so clear that the listener could describe it in one sentence: “The song / story is basically about …..”. The songwriter’s starting point may be a character, a rhythmic idea, a groove, a fragment of a tune, a word, an image, pretty much anything. But for the song to work as a song, at some point, the writer(s) must decide what the song is about, and make sure that all its elements help to put across that idea. If the Big Idea can be expressed in the TITLE, that is a big advantage. It makes the point clearer, more memorable, and probably more commercially viable as well. The Title must at least be able to remind us in some way what the song is about. So the Big Idea – and probably the Title – are at the heart of the songwriting process. 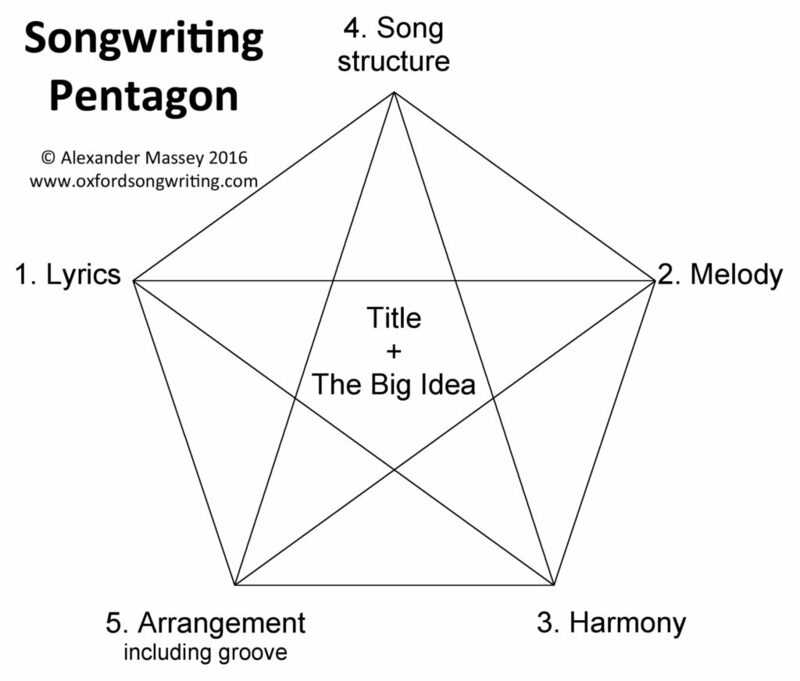 In the Songwriting Pentagon, the Big Idea and Title are in the centre. For a song to work, all 5 elements must serve the Big Idea and the Title, and help keep the listener focussed on the Big Idea and the Title. Every element has a distinct and important relationship with every other element. For example, the natural verbal rhythms of the LYRICS, and the meaning and emotional content of the lyrics must be brought out with appropriate pitch contours and rhythms in the MELODY. The melody can be given very different emotional meanings, depending on the chords chosen for the underpinning HARMONY. Choices of harmony help articulate the SONG STRUCTURE. All of these elements – lyrics, melody, harmony and song structure – can be enhanced by the ARRANGEMENT – the ‘groove’ established for the song, choice of instruments, voices, sound samples, digital manipulation by sound engineers, and so on. And just as the arrangement enhances the other four elements, it is also influenced by them. Songwriting is a dynamic process, in which all the elements are in flux and influencing each other until the final version of the song emerges. There are 10 Overarching Principles that continue to reappear when considering everything in the Songwriting Pentagon (including: Distilling, Clarity, Contrast, Balance, Unity, Start Well, End Well, Progression, Managing Expectations). In fact, the first of these Focus: ‘What’s the Big Idea? And does it have a good Title?’ There are the 4 Cs (Catch all your ideas and material, and organise your working methods; Creativity, sources of inspiration, attitudes that foster creativity, and creativity tools; Critique as a key contributor to creating high quality work; Continuous Learning as necessary part of evolving as a songwriter). There is important information to absorb about the Songwriting Business. And every songwriter has to assemble a basic Songwriting Kit. Each of these is described in much greater detail in the Oxford Songwriting Syllabus.